With a brand new forum and even more great features, your bound to get even more out of the great online scrapbooking classes offered at Get it Scrapped! You simply must check out Tessa Ann's Etsy shop! 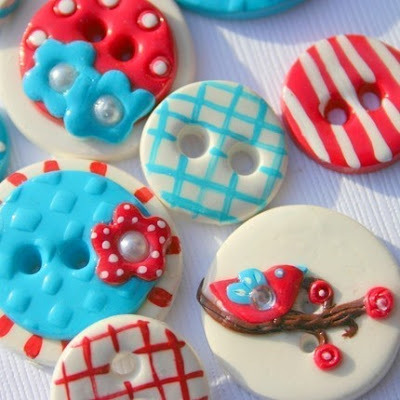 She has the most adorable handmade buttons and felt embellishments perfect for adding a custom look to any crafting project. Another very talented creator of handmade goods, Nicole specializes in custom designed die cut scrolls, 12x12 lace papers and more. They are amazing and nothing you'll ever find at your LSS or big box store. She's adding new designs and colors all the time, so don't miss out. Owned by Aby Garvey, co-author of The Organized & Inspired Scrapbooker , Simplify 101 offers a wealth of workshops, products and other resources to not only get your creative self organized, but the rest of your life as well! Tessa Ann, our new Featured Sponsor for May, has donated a set of her amazing Retro Blue Bird buttons to give away to one lucky reader! Are these adorable or what?!? Leave your comment by Wednesday, May 6th at 11:59 PM CST for your chance to win!